A growing number of neurologists are looking toward emerging combined MRI technologies to diagnose ALS more quickly and facilitate the development of new ALS medicines. MRI double-take. Oxford researchers developed a new MRI program (set of sequences) based on structural and functional measures that may help diagnose people with ALS. Image: NIAMS, NIH. People with ALS experience muscle weakness and ultimately paralysis in part due to the crumbling of neuromuscular junctions, disconnecting their muscles from the motor nerves. But some neurologists suspect that at least some of the earliest seeds of ALS lie instead within the motor cortex – the motor centers of the brain which tell these muscles to relax or contract – which are also damaged in people with the disease. And by zeroing in on these signs of cerebral deterioration using magnetic resonance imaging (MRI), ALS may be diagnosed more rapidly and treated more effectively. Reporting in 2010, researchers from the Oxford Motor Neuron Disease Care and Research Centre in England found using diffuse tensor imaging (DTI) potentially early structural changes in the very center of the brain (the corpus callosum) in people with limb and spinal-onset ALS. But although these changes appeared consistently in patients, these kinds of changes were also previously associated with other outwardly similar diseases. Now in a study that included 25 people with ALS, the Oxford team identified by MRI a network of regions within the brain that may be specifically altered in people with ALS. And, by taking a look at the structural and functional integrity of this network using these MRI measures, the researchers could distinguish people with ALS from those without the disease with more than 90% accuracy. The study suggests that these combined MRI measures may have the potential to help diagnose people with ALS more rapidly. And at the same time these results indicate that the disease may indeed be due to a cerebral system failure. “There is no question this is a whole brain disease,” said University of Oxford neurologist Martin Turner MA PhD MRCP who led the study. The study appears this month in the research journal Brain. Making tracts. Researchers use DTI coupled to tractography to create a wiring diagram of the brain. Video: Luis Concha MD PhD and Daniel Torres MSc, University of Alberta. The Oxford team identified a network within the brain likely affected by ALS by first zeroing in on deteriorating white matter regions in people with ALS by DTI and subsequently using tractography identified grey matter likely also involved in the disease. The researchers then deduced the functional connectedness within this network by resting-state functional MRI (rs-fMRI). Their results confirm that the areas of cortical structural damage extended throughout the brain in people with ALS - well outside of the motor cortex which tells the muscles to move. And, the functional connectedness within this network appeared to be increased in those with more rapidly progressive disease. Early next year, in collaboration with the University of Miami’s Michael Benatar MBChB PhD MS, the Oxford researchers are going to examine people at high risk for developing a familial form of ALS (fALS) to see whether such changes could be used to identify people before they show the first signs of the disease. And at the same time, the Oxford researchers are continuing to monitor people with ALS to determine whether these functional MRI-based measures can be used to track the progression of the disease. Meanwhile, neurologists such as the University of Alberta’s Sanjay Kalra MD are turning to a related MRI-based technique called magnetic resonance spectroscopy (MRS) to try and monitor the disease. MRS enables neurologists to track ALS by measuring chemical changes in the brain that may occur due to the disease. In the mid 1990s, researchers began to explore the the use of MRS to monitor ALS by measuring levels of n-acetyl aspartate (NAA) to estimate neuronal loss in the motor regions of the brain. 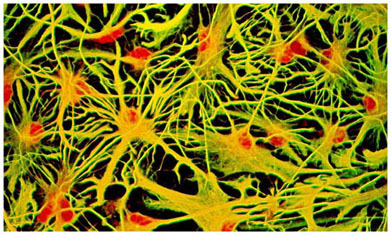 Produced by healthy neurons, NAA is significantly reduced in many regions of the brain in people with ALS. But the levels of NAA can be variable and unreliable. And in some people with ALS, there may not be enough change in these levels to monitor the disease. Astrocyte explosion. In people with ALS, astrocytes proliferate and produce cytotoxic substances that further injure and/or destroy the motor nerves. Called astrocytosis, this explosion of astrocytes is thought to be triggered by the immune response in patients during the course of the disease. Image: National Research Council of Canada. To boost the reliability of these neurochemical measures, Kalra's team in 2006 turned their attention toward another key aspect of ALS – astrocytosis – by measuring levels of myo-inositol in the motor centers of the brain. Produced by astrocytes, myo-inositol allows researchers to track this rise in so-called reactive astrocyte populations in people with ALS which contributes to the destruction of the motor nerves. Their strategy: estimate the extent of both neurodegeneration and astrocytosis in people with ALS by measuring the ratio of levels of NAA to myo-inositol to more effectively monitor the progression of the disease. Reporting in 2006 and 2011, Kalra's team found that the ratios of these metabolites are reduced in people with ALS including in regions outside the motor centers of the brain. And at least in the spinal cord, researchers at the University of Miami are now monitoring these levels in people at high risk for developing fALS to determine whether these changes can predict the onset and monitor the course of the disease. 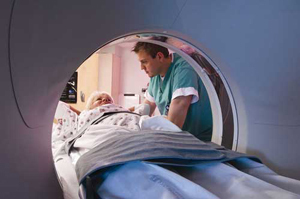 MRI technologies, however, may hold the potential to do much more than facilitate the development of new ALS medicines. By understanding the changes in the brain identified by these imaging tools, neurologists might also have a better idea how to more effectively treat the disease. Making more connections. Oxford researchers discovered that regions of the brain that sustained the greatest structural damage (blue) overlapped with the areas of highest functional connectivity (yellow) suggesting that the loss of inhibitory signals may contribute to ALS. Adapted from Douaud et al. (2011), Brain. Copyrighted and reproduced with permission from Oxford Press. All rights reserved. Peering more deeply into the brain in people with ALS, the Oxford team noticed that the areas of brain hardest hit structurally exhibited the greatest functional connectedness. The researchers speculate that this spike in network activity may be due to the loss of so-called GABAergic inhibitory neurons in people with ALS. The resulting so-called cortical excitability has been observed previously just prior to symptom onset in people at high risk for developing ALS and is characteristic of the disease. The ALS ravaged-brain, explains Turner, may be like a Ferrari with inadequate brakes. If critical inhibitory neurons are indeed lost, potentially toxic brain activity cannot be kept in check. How can neurologists help put the brakes back on in people with ALS? Anti-epileptic drugs might be one possibility at least theoretically, according to Turner. But many of these medications have been evaluated in ALS patients and found to be ineffective. Turner, however, says that this loss of inhibitory neurons might occur very early in the disease process, and therefore for such strategies to be effective these medicines might need to be administered before significant weakness develops. This means identifying and treating people at high risk for ALS well before they show the first signs of the disease. With the recent discovery that an expansion in the C9ORF72 gene may be the most common cause of inherited forms of ALS frontotemporal dementia (FTD) and ALS-FTD, ALS is indeed emerging at least in part, as a whole brain disease. Understanding how these changes in the brain can inform new therapies therefore remains an important goal.